a prominent part in this celebration. states to take part in this celebration? 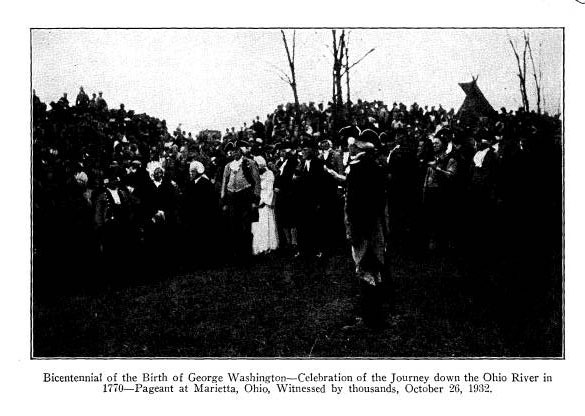 tions was published "Washington's Tour to the Ohio,"
waned to some extent with the passing of the years. the first newspaper that published the suggestion. for granted that little difficulty will be encountered along this line. before the first permanent settlement was established at Marietta. for which no one will have to draw much on his imagination. That should make it doubly interesting. Clyde B. Johnson, State Senator, Charleston. W. Edwin Wells, State Senator, Newell. C. O. Weissenburger, State Senator, Point Pleasant. McGinnis Hatfield, State Senator, Welch. Mrs. Clement L. Shaver, Fairmont. 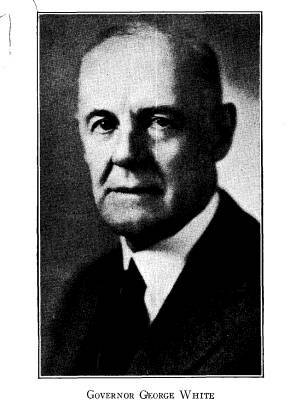 Judge H. Roy Waugh, Buckhannon. W. B. Hines, White Sulphur Springs. Senators: L. L. Marshall and William I. Spangler. Representatives: Virgil E. Cramer and S. Peyton Baker. February 22nd to Thanksgiving Day of the year 1932. Legislative Committee: B. O. Skinner, F. D. Henderson, C.
B. Galbreath, J. C. Campbell. C. B. Galbreath, Guy-Harold Smith. George Washington had three objects in his "tour"
cured for him in Western Pennsylvania. Ohio River for personal purchase. ment for services in French and Indian War. limitably away to the westward of their Virginia home." through his own efforts become the owner of 1,558 acres. to acquire them as he was able. these two rivers unite to form the "Beautiful Ohio." But he had not explored its valley to the westward. He reached Fort Pitt (Pittsburgh), October 17th. £10.19.2 of stores which were purchased from the commissary at Fort Pitt. course does not include anything for the game taken on the voyage. at the stake on June 11, 1782.
by Dunmore as lieutenant-colonel of a battalion to be raised near Fort Pitt. picions of the patriot party so that under parole he was allowed his liberty. removed to Maiden, Ontario, where he died January 14, 1799, of lockjaw. which side of the river he encamped. which school children were numerously represented. Spots, Mrs. O. D. Dailey of Albany; and Mrs. H. E.
McFadden, Regent of the Steubenville chapter. the river's edge from many points, to see the boats pass. They got excellent views and many pictures were taken. kinds and cameras were unobstructed. lined the shores and waved their salutations. Mayor W.
the beautiful, winding, historic Ohio. tinue to shine until the love of virtue ceases among mankind. W. H. Daugherty, Mayor of the City of Wellsville. He seemed unafraid of the venture as forth on his mission he set. --BY LELLIE C. SOUTHWICK LONES. those at Wellsville greeted the river pageant as it passed. party of "pioneers" as they passed. tate before proceeding to "wait for further intelligence"
tainment. These materials were most effectively used. and a very limited number of guests were assembled. trees, waited the squaws and papooses. making the signs of friendship and peace. historian who is in charge. The Indian pageant was written and directed by O. K.
Muth, W. C. Herzog, Margaret Spencer, and Elinor Wilson. with some very fine acting, especially by Mr. L. R.
Webb, representing George Washington, and by Mrs.
Claude Bruner who had the part of the Indian sorceress. Regent, and Congressman Frank Murphy. Mrs. O. D. Dailey, of New Albany, Ohio, D. A. R.
when he traveled in 1770 that highway, the Ohio River. Junction also contributed to the pageant. her dramatic contribution to the speaking parts. set up by Harry McFeely, Steubenville. Not a detail was lost. pageant. News-reel photographers filmed part of the pageant. tation was made by Mrs. Dailey and Mayor G. E. Fithen accepted. Nearly 3,000 persons lingered to watch those ceremonies. tions all that could be desired, but the order was perfect. of autumn to visit the shores of the Ohio no more. chapter to their local history. eight to twelve o'clock in the ballroom of the Masonic temple. families of several generations ago. offset by tall lighted tapers. mittee and assisting her were Miss Katharine Sinclair, Mrs.
score of other ladies prominent in the social circles of Steubenville. 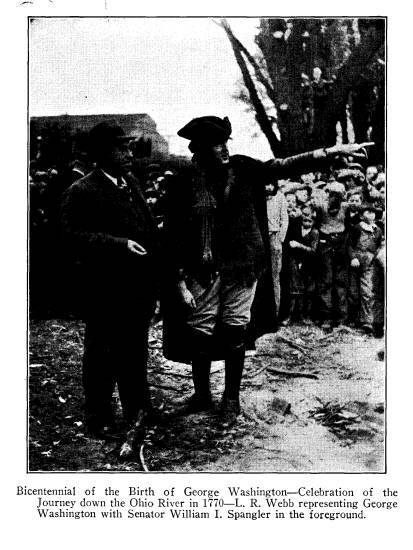 Fort Henry, "George Washington," portrayed by Roy W. Lewis. horns. They wore coonskin caps and the traditional garb. and great nation will arise in North America." stream was an Indian village called Grape-Vine Town. good land as ever I saw." of Sistersville in West Virginia. 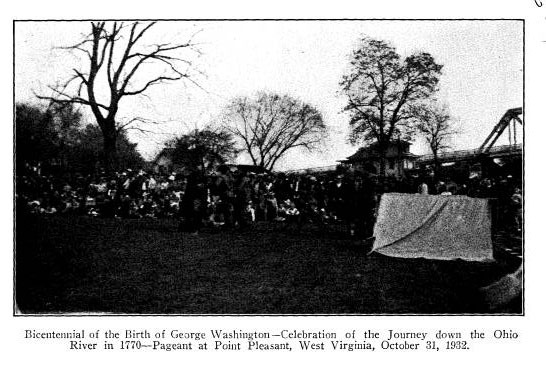 celebrated in the reenactment of Washington's journey. the schools were dismissed to greet them. 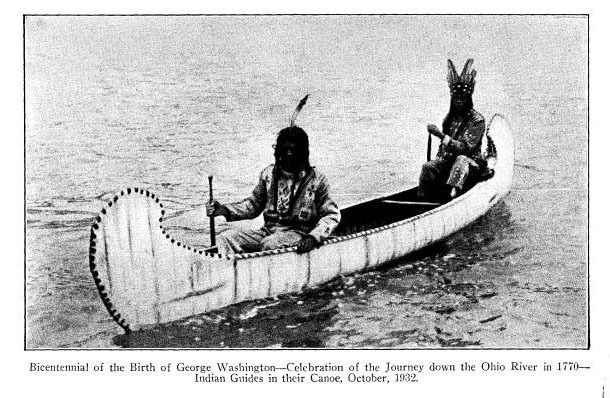 lowed by two men, dressed as Indians, in a canoe. 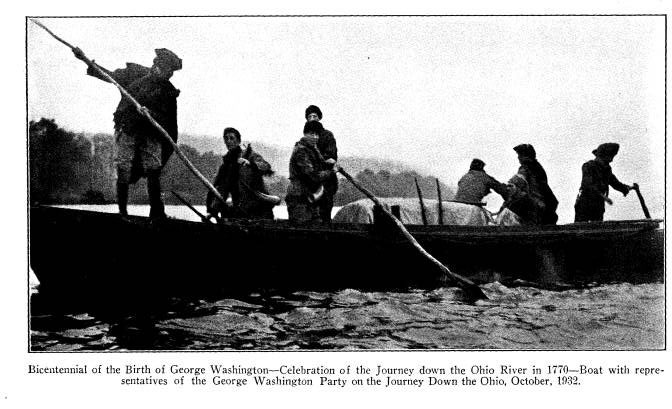 traying the first trip of George Washington down the Ohio river. 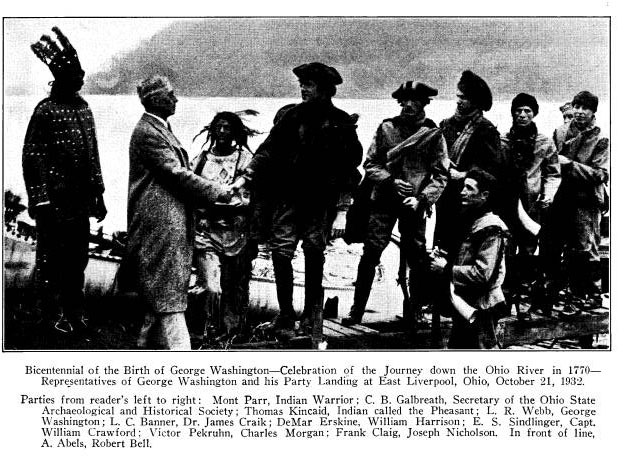 George Washington were dressed in clothing of the colonial days. this side and then went directly across the river to the Ohio side. a great celebration was planned. River journey. This editorial has already been quoted. this point and this expectation was not disappointed. people with Forest I. Boone, a local man, the director. hundred cars passed over Little Muskingum bridge at Reno. with efficiency and satisfaction by Sheriff Gay Thorn and Lieut. from outside Marietta and Washington County. Washington of 162 years ago when he was thirty-eight years old. west Territory in what is Muskingum Park on July 15, 1788.
nam, impersonated by Capt. J. A. Pixley, in the lead. Mayor F.
garden for the past thirty-two years. A word must be said in regard to the broadcasting. The interpretation of the historical episodes by Mr. E.
M. Hawes was well written and very effectively read. audience and by an unnumbered host of "listeners in"
parking space to reach the highways. 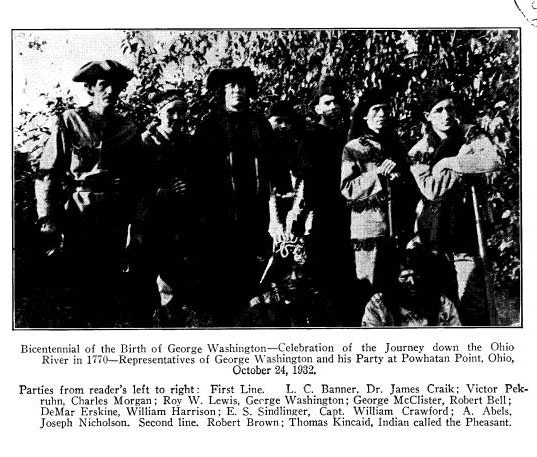 closely connected was that where Washington met Chief Kiashuta. copy of this diary has, as yet, been located by the writer. of pageantry including tableaux and the dancing of the minuet. Marietta pageant the day before. ducted on the forenoon of that date. tance surpassed by few other villages on the Ohio River. called the Great Hockhocking, it "is not a large water,"
that "the Indians say canoes can go up it 40 or 50 miles." and Historical Society Publications, xxxiii: 87-94.
toric sites in Ohio have been appropriately marked. described as follows under the caption "Colorful Scene"
Athens High School Band took an active part in the program. of the Boy Scouts and Girl Scouts of Athens attended the pageant. Senator Spangler and others in short addresses. ing program was successfully rendered at Long Bottom. 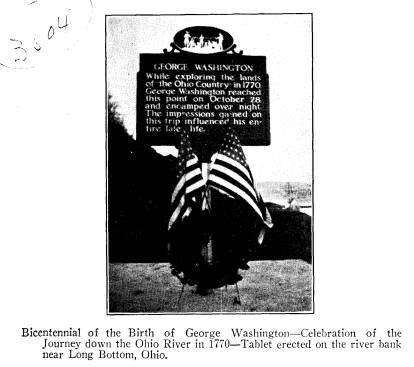 went with him on his mission to the French in 1753.
lowing day in ceremonials of friendship in 1770.
descendants of George Washington, both residents of Middleport. "What brings all these people here this afternoon? "It was 162 years ago," replied the lad. course, many of maturer years. scendants of the Washington family. pageants enacted at different points down the river. entire series of pageants such a remarkable success. within a short distance of this place. quartet who sang, "Hail Columbia." nial Commission, made but a brief talk in presenting the monolith. wood Chapter, D. A. R., where a refreshing tea was served. was the last scheduled in their voyage. 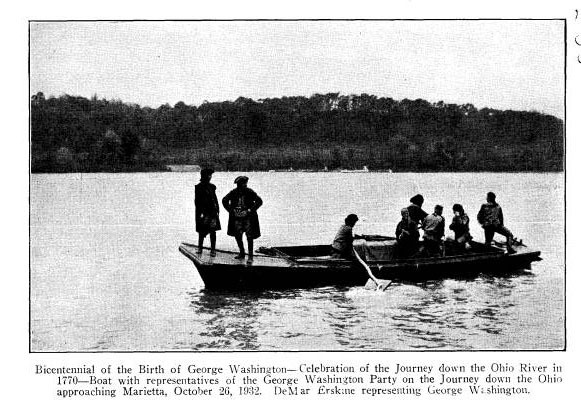 boat and continued their return voyage in 1770.
of the Great Kanawha in 1770.
party 162 years ago, when they landed here October 31, 1770.
claimed on his memorable trip. impression on all who beheld the Pageant. was perfect in every detail. from outside the city were present. began October 21st at East Liverpool, Ohio. delivered an address paying tribute to the nation's first president. unveiled a marker on Mount Vernon farm at Beech Hill near here. A colonial ball was held tonight. not a part of the pageant plan. that was difficult to overcome. Liverpool, Steubenville and Mingo Junction. Mr. O. K.
and interest of the entire country. that would not be denied. helpful influence felt at many points. Junction. Here he left the party for business reasons. represent Washington in different parts of the voyage. in their reception on the voyage.